New York Comic Con: a paradise for fans celebrating and bringing to life their fandoms, appreciating fantasies and getting to be in company with other fans who dedicate their time to emulating their favorite characters through cosplay. This year’s attendee Maliha Fairooz went to Comic Con with a specific goal in mind. She wanted to capture the amazing cosplays executed by hijabis at the convention. ”Cosplay is half the fun at any comic-con and for those who choose to wear the hijab, it becomes twice the fun trying to get creative,” Fairooz says. Muslim Girl: What got you into cosplay and how has being a hijabi influenced your designs? Fairooz: I think I’m like a huge nerd. When I like something I obsess and cosplay is just one of the ways people express their enthusiasm for said character/show. Personally, I was aware of cosplay but only did it when I knew of a friend who’d also done it at cons. Also, I was going to comic con for the first time and I was like I have to represent my fandom in the crowd. Being a hijabi is interesting because it feels like no matter what you do it’s gonna grab attention, which can be intimidating but it’s also like you have attention by default so why not use it to make a statement. And I don’t let my hijab limit my character, I don’t think you have to chose a character that’s hijabi friendly instead I prefer to incorporate it into the cosplay. Why did you make it your mission to search for other cosplayers? Simply because representation matters. I did look up some sort of lead into anyone doing this sort of thing, and there were a few hijabis, but not enough. Those that did cosplay didn’t seem to get recognized. Also, there aren’t photographers who do hijabi cosplay at all so I wanted to document for people who are thinking of doing it but don’t have any medium to look into it. Plus, hijab cosplay is maybe common in some East Asian countries but I don’t think it has a huge following in the West yet. Another thing is I think it’s better if someone from a similar background were to cover their stories. Meaning there are folks who do cosplay photography on the regular but they may not be Muslim or hijabi, so it’s nice to support each other. Watch out humans, here comes Princess Mononoke. What anime/manga or show/comic got you into this fandom? My intro to nerd culture… idk… I was always the weird kid. If I liked something I had to know all about it, break it down and analyze it. So I think HP (Harry Potter for all the muggles) was definitely an intro to fandoms in general. I was a huge Spiderman fan as a kid, and I love that it has evolved into Marvel Cinematic Universe. Cosplay did originate in the East for anime characters but I’m more into Marvel comics and western fandoms like Harry Potter, Doctor Who. So I emulate the characters from shows I like. Maleficent slaying and she knows it! Some might say dressing up as character is similar to practicing Halloween what do you have to say to the wallah bros about that? Do I have to answer this XD. Belle as beautiful and brilliant as always. Who is your favorite character so far that you have cosplayed? It’s my first character. Her name is Peggy Carter, she is often seen as a supporting character or Captain America’s love interest. But if you look into her character, she is a total BOSS! She wasn’t waiting around to be helped but rather helped Cap America, showed him the ropes. Also after the loss of Cap, Peggy is a working woman in the government post-World War II, so she had to put up with the patriarchal system. To top it off, she ended up being the founder of SHIELD, a government organization in the comics–something similar to the CIA in real life. Lastly who is your favourite cosplayer? That’s a hard one. I wanna say my friend Happy cause she basically does lowkey cosplays on the daily. Her room is like entering Narnia every single time. She is total nerd goals. Happy is like the proudest nerd ever. She is a total go big or go home type of person. And honestly, she’s the one who made me comfortable with my nerd side. The TARDIS inside the Doctor? Are you Muslim and a cosplayer? 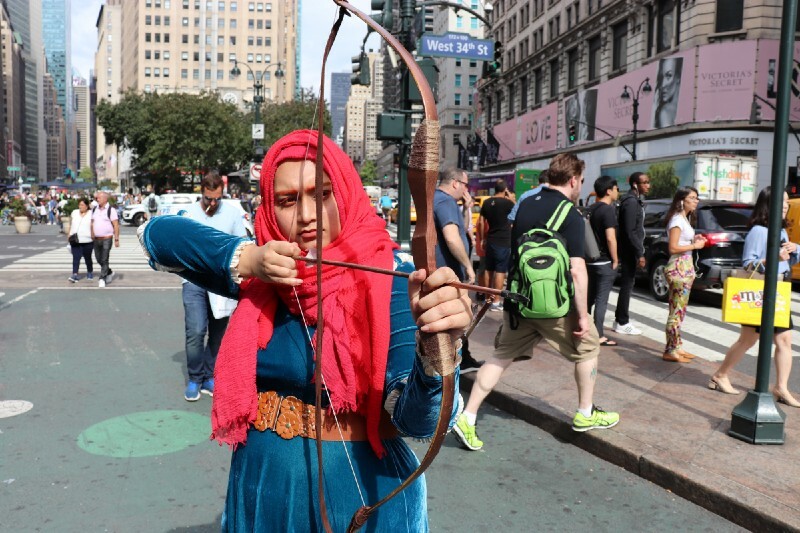 Tag us at #MUSLIMGIRLCOSPLAY.